A few months ago I was going through a particularly stressful time at work. My mom, bless her heart, would often do little things to cheer me up. One day I received a small note from her, along with a picture. 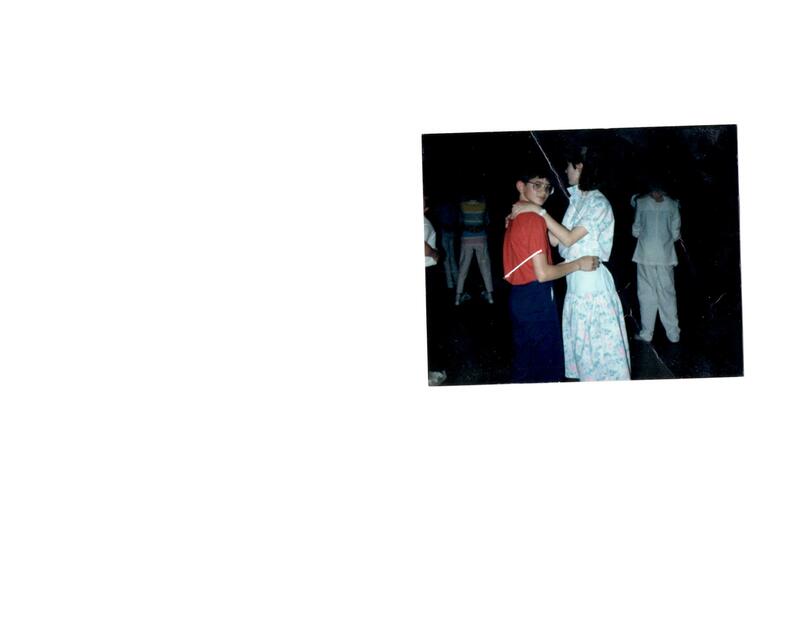 The note simply said, “I’m sorry that I embarrassed you.” I then turned over the picture to reveal a snapshot from my 8th grade dance, circa 1987. There I was doing an awkward slow dance with Kevin K. Even though I was only five foot three at the time, I hovered over poor Kevin, who had clearly not hit his growth spurt yet. I remember this moment vividly. And by vividly I mean as much as I could remember in my mortified state. Kevin had made it very clear he had a crush on me, and I had spent many a day at the roller rink hiding in the bathroom during the “couples only skate” so I could avoid him. He managed to corner me at this particular dance, and I was never one of those girls who could just say no – to a dance, that is. I decided it would be more awkward to turn him down rather than actually slow dance with him. I don’t remember my mom taking the picture (my head was turned the other way, as you see), however I do remember the picture surfacing a few days later and my mom innocently proclaiming that “someone dropped it off on my desk at work”. Not only was I mortified, I was gullible. I believed her! It was not until years later that she ‘fessed up and admitted that she was the sneaky paparazzo of St. Joseph’s middle school. Caught by the Sneaky Paparazzi – my Mom! It took some time, but eventually I came to realize that my mom’s photography and other similar embarrassing moments never really mattered. If anything, her sense of humor with these awkward situations helped foster my own goofy sense of humor. Will I embarrass my own stepkids as teenagers? I’m sure I will, whether I mean to or not. Sometimes when you are faced with the Kevins in life (and in my case, the Jeremys and the Delmars too) all you can do is roll with it and laugh. You never know when you may be having a bad day and a gawky picture of yourself arrives in the mail. And then you are reminded that you are a survivor…of embarrassing parents.